As you prepare to tackle your kitchen remodel, the first tip I have is to consider lighting right from the very beginning. Lighting can truly make or break a space, and I don’t want you to spend your time and money creating your dream kitchen and then be disappointed in the end because it doesn’t feel right or complete. There is no ‘tried and true’ method for setting a lighting budget because it is very dependent on the size of your kitchen and how high end you want your fixtures to be. As a starting point however, when you are doing a complete remodel, I recommend allocating at least 1% of your total construction budget for the electrical and fixtures. To be sure you use that money wisely, start by pricing out the basics. We’ll get into this detail in a minute, but for now, know that you’ll need recessed lighting and pendants. With the remaining budget, add lighting under, on top of or inside the cabinets and enhance the design of your fixtures. What Don’t You Like In Your Current Kitchen? Consider everything from the type of lighting, to the design of the fixtures, to the level of control you have; this will help you define what you want and need in your new kitchen. How Will You Use the Space in Your New Kitchen? Identify the activities that will take place in your kitchen; in addition to the standard kitchen tasks of cooking, baking, and meal prep, how do you and your family use this space? Are you entertaining guests or are your kids are doing their homework? Maybe you do your crafts and watch the latest Netflix series, have your morning coffee and read the news, or host neighborhood game nights. Or maybe it is a combination of all the above. How you use your kitchen should influence the lighting. Place these lights in between the island and wall cabinets for general room illumination. Recessed lighting is the foundation that provides the building blocks for the rest of the layers of light, so it’s important to start here and get it right. Bring light down to illuminate sitting, dining and the more intimate conversation and activity areas. Common locations include over the kitchen island, dining table, and even the sink. One caution I have for you as you bring the light source down, make sure to keep the fixtures above the line of sight. Light up your work surfaces with task lighting, specifically under the upper cabinets. Use LED lights in these applications to keep the heat down. Other places you can incorporate task lighting is above cabinets and even under the island and cabinets to provide security lighting. The final and most fun part of planning your lighting is choosing your fixtures. I’ve pulled a few classic and modern lighting samples to get you thinking about your style and design preferences. Your options are endless, so let your imagination run wild. At this point in your remodel, your dream kitchen is just a few light fixtures away from being reality. 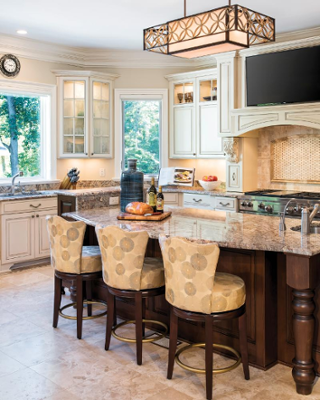 If you decide to use a lighting design specialist for your kitchen remodel, please consider us. Or, if we can help in any other way, let us know.